Worried About Clogged Arteries? Try Drinking This! Millions take toxic cholesterol and blood pressure lowering drugs that may do nothing to reduce heart disease specific mortality. Pomegranate juice, on the other hand, actually reverses underlying pathologies of the cardiovascular system that lead to bypass surgeries and heart attacks. One of the most amazing clinical studies ever performed has been hidden away behind a pay wall for over a decade. When I first stumbled upon this clinical pearl two years ago, in the form of the publicly indexed abstract on pubmed.gov, my jaw nearly dropped. I've finally acquired the full version of the study and am now excited to report on its implications in greater depth to help raise awareness about the power of pomegranate to heal the body, and I believe, save millions lives from premature death from heart disease. "Pomegranate juice consumption resulted in a significant IMT [intima media thickness] reduction, by up to 30%, after 1 year." We shouldn't be that surprised at how great an interest there is among the masses in safe, delicious, and affordable drug alternatives that have the power to unclog arteries? Certainly the drugs aren't working, with the most popular class -- cholesterol-lowering statins -- being linked to over 300 adverse health effects. But sometimes the technical language of medicine gets confusing: what does this pomegranate-induced reduction in the intima media thickness (IMT) of the arteries mean? The intima media is the middle portion of the arteries that become inflamed and fill up with plaque comprised of oxidized fats, immune cells, and their debris, in the condition known colloquially as "blocked arteries." As the intima media grows thicker, less space is available for the blood contents to move through the opening (lumen) of the arteries. When the arteries eventually close or are blocked, catastrophic injury or death may follow. Therefore, anything that can safely reduce, or better, reverse intima media thickening is the holy grail as far as obtaining a root cause resolution of atherosclerosis, and by implication would profoundly reduce deaths linked to cardiovascular mortality. Indeed, in a world where the #1 cause of death is cardiovascular disease, and where we preemptively medicate millions more with drugs that only reduce surrogate markers for cardiovascular disease risk – i.e. lipoproteins carrying cholesterol – without showing any convincing evidence that it is reducing cardiovascular disease or all-cause mortality, how could something as simple and powerful as pomegranate be overlooked? In fact, if a simple daily dietary intervention is capable of regressing and/or reversing the underlying disease process in millions of fatal cardiac cases, it would seem highly unethical not to use it. Here, we wish to bring some of the finer details of this clinical trial to light, to further substantiate the value of botanical and food-based interventions not only in preventing but treating major chronic disease processes like cardiovascular disease, the developed world's most deadly disease. 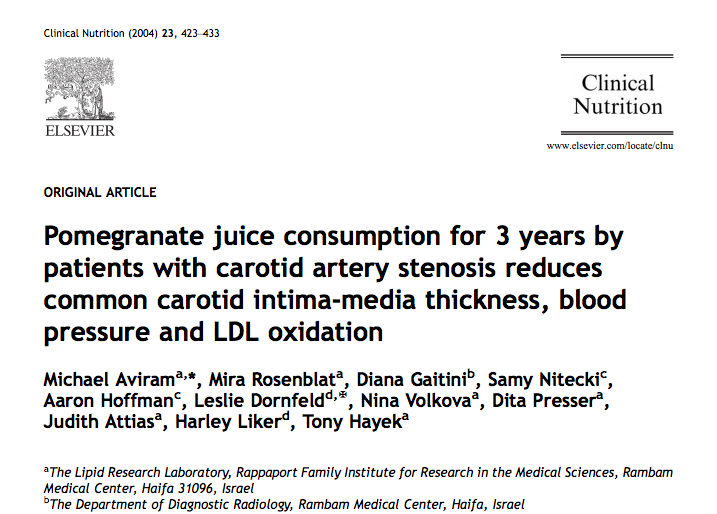 Published in Clinical Nutrition in 2014 and titled, "Pomegranate juice consumption for 3 years by patients with carotid artery stenosis reduces common carotid intima-media thickness, blood pressure and LDL oxidation," Israeli researchers discovered pomegranate, administered in juice form over the course of a year, reversed plaque accumulation in the carotid arteries of patients with severe, though symptomless, carotid artery stenosis (defined as 70–90% blockage in the internal carotid arteries). The ten patients in the treatment group group received 1.69 ounces (50 ml) of pomegranate juice per day (about the volume of a shot glass), which contained .036 milligrams of total polyphenols (primarily tannins and anthocyanins), for a period of 1 year, and five out of them agreed to continue for up to 3 years. While these results are impressive, if not altogether groundbreaking for the field of cardiology, they may be even better than revealed in the stated therapeutic outcomes above. 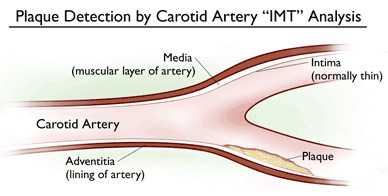 When one factors in that the carotid artery stenosis increased 9% within 1 yearin the control group, the pomegranate intervention group may have seen even better results than indicated by the measured regression in intima media thickness alone. 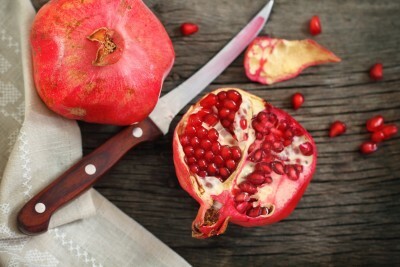 That is, if we assume that the pomegranate group had received no treatment, the thickening of their carotid arteries would have continued to progress like the control group at a rate of 9% a year, i.e. 18% within 2 years, 27% within 3 years. This could be interpreted to mean that after 3 years of pomegranate treatment, for instance, the thickening of the arteries would have been reduced over 60% beyond what would have occurred had the natural progression of the disease been allowed to continue unabated. "The cholesterol content in carotid lesions from the two patients that consumed PJ was lower by 58% and 20%, respectively, in comparison to lesions obtained from CAS patients that did not consume PJ (Fig. 3A)." "[T]he lipid peroxides content in lesions obtained from the patients after PJ consumption for 3 or 12 months was significantly reduced by 61% or 44%, respectively, as compared to lesions from patients that did not consume PJ (Fig. 3B). "A substantial increase in the lesion reduced glutathione (GSH) content, (GSH is a major cellular antioxidant) by 2.5-fold, was observed after PJ consumption for 3 or 12 months, (Fig. 3C). "LDL oxidation by lesions derived from the patients after PJ consumption for 3 or 12 months, was significantly (Po0.01) decreased by 43% or 32%, respectively, in comparison to LDL oxidation rates obtained by lesions from CAS patients that did not consume PJ (Fig. 3D)." Believe it or not, pomegranate has many other ways in which it can help to heal the cardiovascular system, as well as other organ systems. Our research project has identified over 100 distinct health benefits of pomegranate: View the Pomegranate Research Database.